Half graffiti and half grown up. 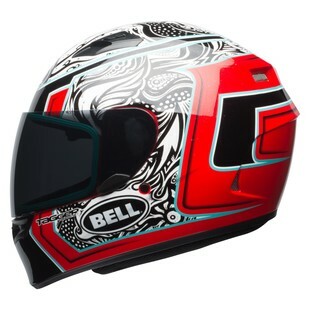 Such is the look of the Bell Qualifier Tagger Splice Helmet. Like that interesting time after college and before worrying about your 401k, the Tagger Splice Graphic is equal parts youthful exuberance and full on adult. The graphic itself starts in the front with spray-paint-inspired designs and transitions to the back where a solid, reliable, stable graphic takes over. It lives equally in both realms. Additional features of the Bell Qualifier Tagger Splice Helmet include a removable and washable liner, aerodynamic shell, ClickRelease shield change, and a five-year warranty offered by Bell. Two things being brought together makes things interesting. Just look at peanut butter and jelly. Each is good on their own, but when you bring them together “WOOO!! !” The same can be said for childhood energy and adult sensibility. This helmet does precisely that.